Need Frigidaire Washing Machines Reviews and Frigidaire Washer Ratings? The Frigidaire brand has a long history dating back to 1916, when its founder actually invented the first refrigerator. Frigidaire has since become an American based icon creating all types of appliances, including washing machines. Frigidaire manufactures a range of washers, starting at $400 for Top loading models up to around $1,000 for its highest end Front Loading models. The Frigidaire collection of washers includes the Gallery, Frigidaire and Affinity lines. The Affinity line is Frigidaire's flagship. $1,000 for their flagship washer is relatively low when compared to some competitor's offerings, which easily approach $2,000. Frigidaire's big on style and their machines general have appeal. Most washers are available in multiple colors like classic black or white along with more adventuress colors like blue and red. At these price points, Frigidaire washers do generally underperform in a few areas including Capacity and Noise. #1) Price: Even at Frigidaire's highest price point its still way less than other washing machine manufacturers top models. You get what you pay for and in Frigidaire's case this generally isn't a bad thing. #2) Great Styling: For some, look and feel of their washing machines is an important factor and Frigidaire makes some slick looking machines. Multiple color options for most washers also help add to the appeal from a style standpoint. Styling also carries over to easy to use controls, which should allow you to get up and running quickly and intuitively. #3) Many Cycles: Most Frigidaire washing machines over around 7 wash cycles to handle various size and soiled loads. Most also offer 15 wash options, including Energy Saver to help reduce operating costs. Some Frigidaire washer models also offer a super fast 25 minute wash cycle for smaller loads. This is among the fast cycle times we've seen on the market. #4) Simple Machines: Don't expect Frigidaire washers to have all the newest buzz word features, including steam etc. They tend to make more basic machines which work well. Their washing machines generally clean well and are reliable. #5) Efficient: Most Frigidaire washers carry the Energy Star rating and have cycles that use less water or colder temperatures for less soiled clothes. These attributes will prove to save you energy and associated costs over the life of the machine. #6) Great Reviews: According to its user reviews, Frigidaire user reviews are generally excellent and most would recommend a Frigidaire washing machine to a friend. Most user review comments mention pros being many adjustable settings, consistent cleaning, energy efficiency and that the machines do a great job removing moisture during final spin cycles. #1) Excessive Vibration: Some Frigidaire washing machines are plagued with excessive vibration and noise levels. This could cause issues for users considering second story instillations or that plan to locate their washer close to the bedroom. While most washing machine vibration issues can be solved by proper installation and balancing, this is still something to keep in mind. #2) Low Capacity: We're not saying 3.5 cubic feet is tiny, but with most manufactures offering machines that max out at 4.5 cu ft, the lack of volume could mean more loads. Some users, washing larger items such as King Sized comforters could have issues here. If you have a large family, over 5, you may want to consider other brands. If you can live with a max capacity at 3.5 cu. ft. then you'll save yourself some money on your washing machine purchase. #3) Long Cycles: Many users' reviews complain about long cycle times. 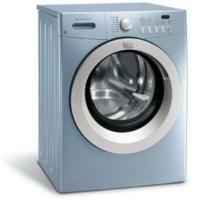 Read individual Frigidaire washing machine reviews for more details on each model. Frigidaire is an underdog contender in the washing machine industry. If you're interested in good looking washers that are energy efficient, very adjustable and wont break the bank, then Frigidaire may be the right choice for you. If you have a large family with heavy laundry load demands you may want to look elsewhere. Keep in mind that these comment are just general Frigidaire brand observations, so be sure to read WashingMachineReview.com reviews on individual Frigidaire washing machine models before you make your final decision.